Lucy had an older sister who was quite talented and inspired Lucy. Lucy says: "This evening dress I was wearing for the Junaluska queen contest, was my sister's "hand-me-down" wedding dress. They dyed it soft blue for me to have this picture taken in. The flowers are red, so it was lovely." Lucy tells us, "My sister was into dance and singing and dramatics. 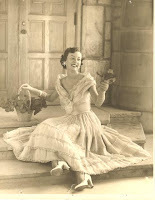 She became Miss South Carolina and went to the Miss America Contest in Atlantic City in 1945. I was in the 5th grade.She won the first Talent Award ever given.Dramatics and singing won her that, and she traveled with the Miss America Troupe." But it wasn't necessarily only her sister's influence whose acting/speaking/singing bug bit Lucy,too. Lucy's dad was in show business first. Lucy says,"I heard his stories all the time and was fascinated. William Morris booking agency was his manager in Atlanta, Ga. for a short career with a trained horse. Prince Maxwell was his horse, and he had him do tricks on the stage.The night his preacher dad sneaked in and saw the show (his son was supposed to be playing little school programs in towns etc. NOT big shows on stage) was the end of his career.The first act that he had Prince perform, was to pretend that he was going to church. Then Prince knelt down and put his head to the floor. 'Well you would pray, that's great Prince!'" In part one of Lucy Adams we learned how Lucy got her name, how she developed into the beautiful and precocious young woman who later went on to speak and write about hymns and God's love in her life. At nineteen she met the love of her life--Woody Adams--and her life became a life-long duet of praises. I love a great love story, don't you? 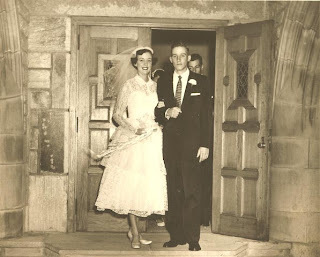 "In June 1953, I joyfully entered the chapel at Lake Junaluska, North Carolina, where the youth group was having the first Sunday afternoon meeting of the summer. I stopped abruptly. Turning to my friend Betty Anne, I mumbled angrily, 'Oh, no, not Woody Adams again!' There he was, sitting down in front. She knew exactly what I meant. Last summer, I had dated a boy named Bill, until his friend Woody Adams showed up. Woody had been the perfect excuse for Bill to forget me and 'join the boys.' I had continued to pursue Bill: I baked homemade cookies and took them to the place he worked. When he was 'too busy' to see me, I left the cookies at the desk. I walked in all of our old familiar places, hoping to see him. One quiet afternoon as I walked by the lake I saw a boy sitting on top of the double-decker sightseeing boat. Thrilled to find Bill alone, I hurried toward him. But when I reached the boat, I saw that it wasn't Bill at all, but his friend, Woody Adams. His broad smile startled me. 'Do you know where Bill is?' I asked. I walked away at his negative reply.For the remaining weeks of that summer, I never changed my mind about Woody Adams - he was a pest. Now here he was again. I sat at the back of the chapel with Betty Anne, determined to avoid him. A week later there was a talent show with youth from different work areas around the lake. After some crazy skits, dances and music, everyone was better acquainted. There was only one person who was getting my attention, however -Woody Adams, master of ceremonies. As I watched him M.C. the program, my feelings about him changed. The 'pest' began to look very interesting. The final song did it: Cupid's arrow found me with a thunk! As Woody sang the closing song, Too Young his rich baritone found a home in my heart. When it was over and everyone was leaving, my one objective was to say something to Woody. Something nice. I spent the entire program planning my exit sentence, 'Woody, I sure am glad I like you this summer,' I called out. Then I left. We began to talk. Hours moved into days and we were still talking. I liked his honesty, kindness, understanding, and lots of other qualities. His hair, bleached by the sun, was very light against his dark tan. I liked that, too. Suddenly all the other boys seemed uninteresting. Bill was but a memory. I had made a prior date with a boy named Ray, however, and I felt I needed to keep it. We went to the local hangout and danced to the jukebox. Woody was there, too. He came over and asked to dance with me. The song that was playing was 'Too Young.' We were in our own world. We whispered about dancing right out the screen door into the dark of the night. But at the end of the dance, Woody returned me to Ray. When Ray walked me back to my hotel, I told him I'd not see him anymore. Through the years, we have shared our love story in word and song. Woody opens it by singing 'Too Young.' On the last line I join him in harmony as we sing, 'We were not too young at all.'" Lucy says the story has been in newspapers for Valentine's Day, as well as the numerous times they've told the story in song and words. Lucy plays the autoharp. But in the last post I said I'd tell you how Lucy and I are connected. 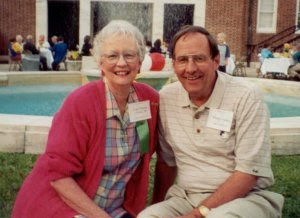 Lucy and Woody were asked to pastor the Waynesboro Methodist Church, Tennessee in 1959.They had two sons at the time,aged 3 and 1, and a beautiful boxer dog named Rusty. Lucy was only 25 years old and Woody was 26. Lucy taught high school Sunday school. And she remembered some Warrens--my Uncle Pat. Uncle Pat(his nickname) was my grandfather's brother. I lived in Waynesboro around the same time as Lucy. 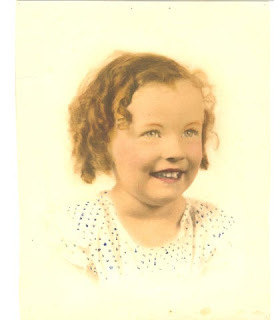 I've told the story on this blog about my mother being in a TB hospital in Indiana, and how I came to live with my grandparents in Waynesboro, Tennessee for several years while my mother battled for her life, and my dad worked in Indiana. Several years later I went back to live with my parents in Indiana--but we returned a lot to visit Waynesboro. I love Waynesboro. Generations of my people have lived there, are buried there, and still do live there. I was there at the same time as Lucy, and her boys are about my age. But we have never met in person. We met online in a Christian writers group called Christian Writers Fellowship International.I feel as if I've known her my whole life.She's around the same age my parents would've been had they lived. She has a telephone interview from her home in NC to Seattle, WA on the first Thursday of each month from 7-9 Mt. time,( but usually is on about 8:30Mt Time/11:30 Eastern time ) Catch her on KCIS - AM 630 on the Living Christian Show. You can click on www.kcisradio.com and then click "Listen In. "Check the web site for schedule changes and broadcasts. May the Lord bless us with Lucy's songs for many,many,many more years. If you have a favorite old hymn, leave a comment here mentioning it, and you could win a copy of Lucy's book, 52 Hymn Story Devotions. (Leave me your email address but use the words "At Server Dot Com" so it won't be picked up by meanies. )I will not divulge your information you send to me, nor use it in any way except to send you Lucy's book. Deadline for contest comments is July 23, 2007. There are so many wonderful old hymns that I couldn't pick just one as a favorite; "Blessed Assurance", "Softly and Tenderly", "The Garden", "When I Wake Up" and so many many more. My children's favorite is "I'll Fly Away" though. Does that count? lol. This was a wonderful "When I Was Just A Kid" feature on Lucy Adams (both parts were great). Thanks for sharing it. I love so many hymns it's hard to pick a favorite. "And Can It Be," "Amazing Grace." and "O For a Thousand Tongues to Sing" come to mind readily. I could go on and on.. And one day we will! I love many old hymns because my grandmother taught me to play the piano and assigned many of them for my lessons. She was an accomplished pianist who played for church. More recently, a favorite hymn is "In the Garden" which was played at the funeral of a close family member. I'm not sure how to accomplish it the way you've described, but please enter my name in the drawing. I love the old hymns and mourn their gradual disappearance from today's church worship services. But I think, all things considered, my favorite hymn of all time is "Amazing Grace." It simply chokes me up every time I hear it, or sing it. For angels never felt the joy that our salvation brings." At our current church we rarely do hymns. While I love contemporary music, every now and then I long for the songs of the faith that I grew up with. One song that holds a special place in my heart is "What Wondrous Love is This?" It's a beautiful old, haunting melody that asks a timeless question. How could God lavish his love so? My husband and I had two good friends sing it at our wedding. It seemed especially fitting in that setting. Thanks for sharing all those wonderful photos too! I enjoyed every one. I am so thankful for all of you leaving these titles, as all of them are running through my head now. I do love hymns--what a nice reminder. Each hymn has also brought up special memories for each of you, and I love the stories with them. I like all these comments! Bill, I love your comment,"I could go on and on.. And one day we will!" So true. Remember, you have until Monday to enter the drawing for Lucy's hymn story book--which reminds me of a song--"I Love to Tell the Story!" I love the old hymns; choosing a favorite is difficult. One that I love that you never hear any more is "Little Is Much When God Is In It" Another favorite is "How Great Thou Art." Lucy's the YOUNGEST 73 I've ever known. Even her eyes dance when she talks to you. Crystal, this has been a great blessing. Thank you for writing a Blog about me. Reading other peoples' comments about hymns is a thrill. God has blessed us with His music to feed our souls. I am thankful for the honor to tell His story.